As the colonists and settlers arrived in the new world, they approached the new territory from the only perspective they had, their native land. Whatever was similar to their native homeland was quickly utilized but new things, including different plant species, were not initially valued. Tobacco was one of the main success stories in the early history of America. The concept of growing tobacco for profit was not new but the product from the colonies was successful. As the new governments desired land to be occupied the settlers progressed westerly. Land was offered in races and other claims and farmers selected land without an understanding of grass species. They sought land that looked productive, had a water source, and often they wanted timber for building. The land with only grasses was not often desired. As their claims became homesteads (1600's-1890's) the farmers ordered inexpensive seed of whatever was available, giving little thought to species adaptation or characteristics of cultivars. Since many were familiar with Europe, cool-season species were imported from western Europe. During the 1890's a remarkable change began. Land Grant Universities were established and scientific testing began on plant species. Land Grant Universities were important in the rapid development of American agriculture. During the 1930's public institutions began breeding research and application, mainly with corn. During the 1940's and 1950's there were significant "landmark" cultivars produced by public institutions. The University of Kentucky released KY 31 tall fescue. 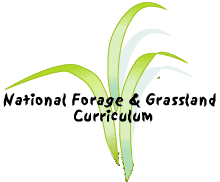 Oregon State University released Alta tall fescue. The USDA in Virginia developed Potomac orchardgrass. Grass breeding work continued within the public institutions, but in the 1960's private companies began to focus on alfalfa for higher yields of high quality forage. In the 1970's, the Plant Variety Protection Act was passed as a patent-like protection for sexually reproduced varieties. This provided a way to profit from research by creating specific markets. Throughout the 1980's and the 1990's many private forage varieties were released, increasing the choices available to farmers and ranchers.